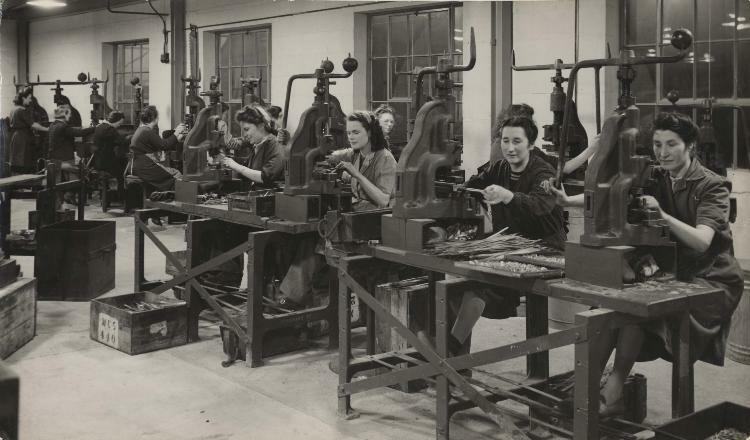 Brighton & Hove Museums have been trying to identify some old black and white photographs of women at work in a factory that were sent to Brighton Museum from Woking Museum. We have some idea of where the photographs were taken but still don’t know for sure if they are of the Brighton area, and we were wondering if your website users might be able to help. 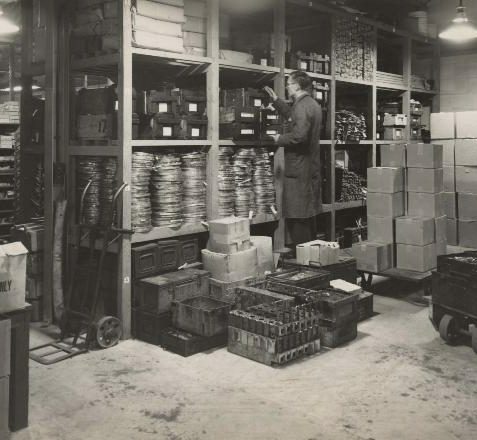 We do know that the photographs were at least processed locally – they are all stamped ‘Averys, 77 St. James Street, Brighton’ on the back. 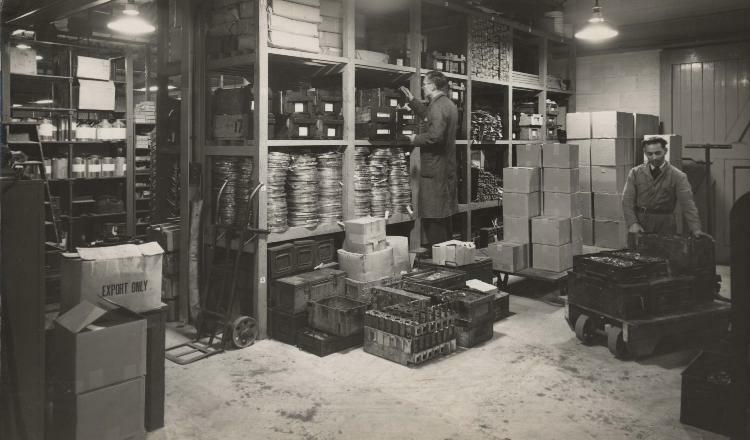 The pictures were most probably taken during WW2, possibly in a munitions factory. This makes them of particular interest because a) during this time photography would only have been permitted in special circumstances, and b) given the subject matter they would have been highly sensitive photographs to take at the time. The obvious answer would have been that these are pictures of an AllenWest factory but we have it on authority that they are not. There was an Electrical Engineering company called ‘Galliers’ whose head office was just up the road from Averys, and this is our best guess yet. I would certainly have said War Work and Allen Wests. However, looking at picture 6 there is a container with ‘Export Only’ written on its side. 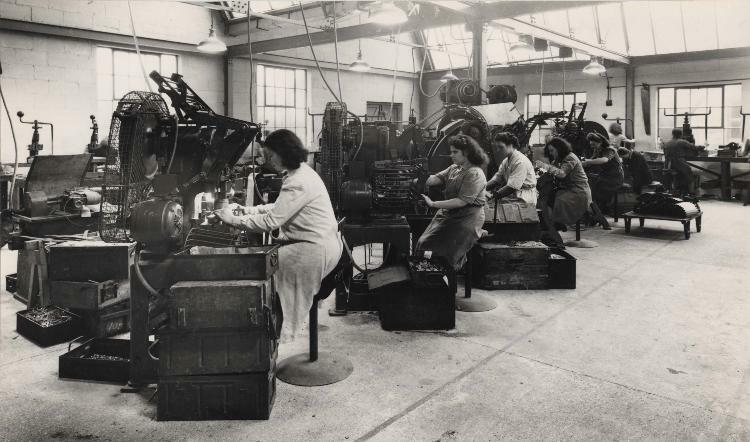 This would seem to make it post war, but still the 1940s especially as there are a large number of women working the machinery. I can remember being taken up to London by my mother at the end of the 40s and seeing a lot of goods marked ‘For Export Only’. I would definitely say post 1945. There are no black out curtains. During the war Woolworths along the London Road was turned into a factory for the war effort. I had a female relative that was there.I am not sure what was made could have been parts for machines . 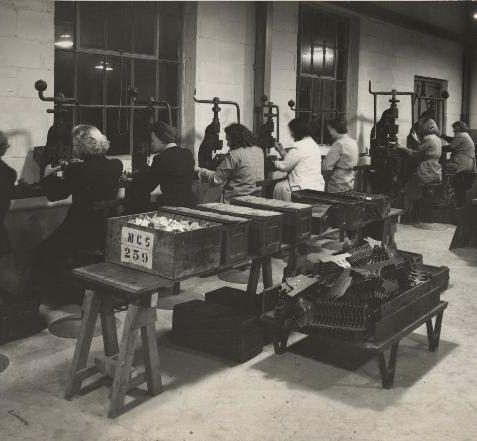 It was mainly women employed there. I think perhaps that is why the German aircraft used to fly down the London Road straffing the area with bullets. The windows of the Store were painted black and no lights could be seen through. 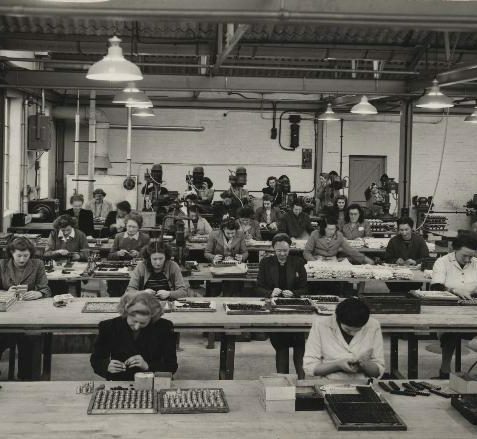 I worked as a trainee ‘Centre-Lathe Turner’ at Allen West for a year in 1973, and i must say it certainly looks like the factory in Moulsecoomb Way circa 1946. The windows look similar to the old Allen West factories both at Coombe Road and in Moulsecoomb Way. 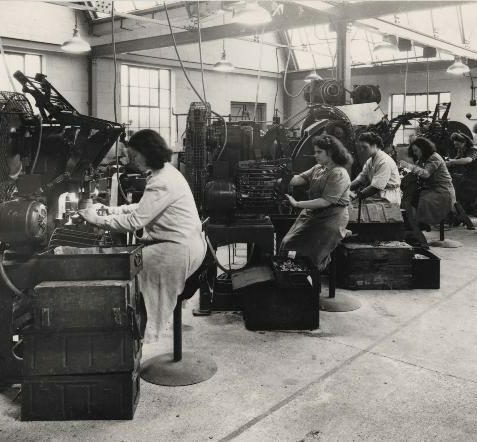 Another thought, my Aunt, Alice Bamber, worked in a munitions factory in Brighton during the First World War, but I don’t know where that was. I will have to ask her daughter. It could be as early as that. Post-war 1940s seems about right. The fashions are certainly 40s but, if this was wartime, there would have been blackout curtains and possibly also paper tape glued across the glass to try to contain shards if the windows were blown in. This was the period of post-war austerity, continued (or worse) rationing and of the desperate national need to earn hard currency which produced the official slogan “Export or die”. The space and layout suggest a fairly modern, purpose-built factory out of the town centre – but I have no idea where. I worked as a trainee engineer in the mid-1950s. 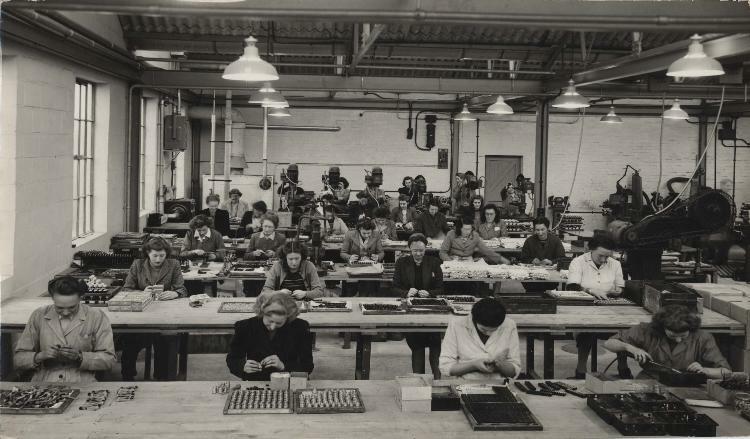 A lot of the senior machinists had worked at the CVA factory on the north side of Bristol Road near the junction with Bedford Street. During the war, and I believe for a short period thereafter, there was an engineering works next door to the Odeon Cinema, Kemp Town in St.Georges Road. Later it was, I believe, a pharmaceuticals warehouse. 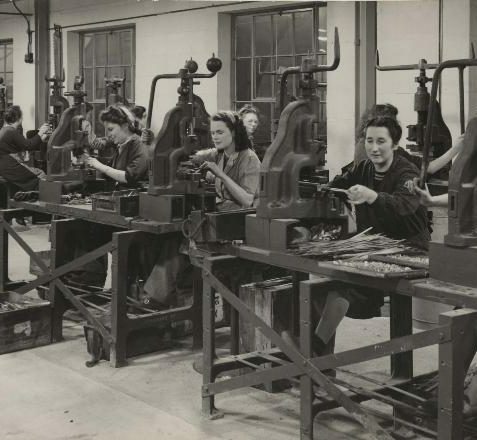 My mother, long deceased, would tell me that she worked in an ‘aircraft factory’ during the First World War. It was in St. James’s Street. She would mention the ‘dope’ that was used to treat the fabric of the wings and body. For Peter Clark, have a look under the heading of Local Folk, Mary Shillingford (AKA Polly). Perhaps your Mother’s in the picture. If so, please add a comment. My great grandfather was a cinemagraph artist in 1908 in Brighton, as yet have not found out which cinema. Also he was a photographer’s assistant in 1915, his name was Geoffrey Thompson. If anyone has any information on him I would be very grateful. 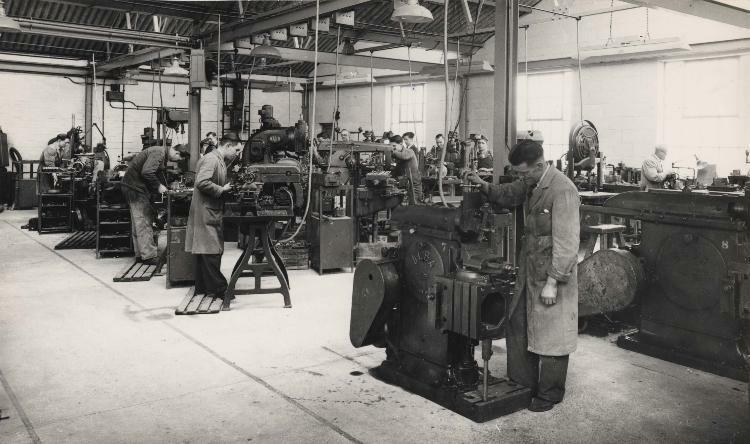 This looks a lot like W.F.Bannister (Brighton) Ltd. machine shop on Lewes Road where I worked during the war 1940’s. I have their brochure if you would like a copy. I came to Canada as a war bride in 1946. Is the photo possibly Mullards? They made valves for radios. I worked there for a few weeks welding in 1958. The factory was, I think, in Davigdor Road off the Seven Dials. Hello Mary Funnel, are you any relation to Janet Funnel, who lived in Staplefield drive? My sister used to play with Janet, my sisters name is Margaret Dowds. My dad worked there, his name was Patrick Dowds. I’d love to have a copy thankyou. My mum may be in this photo, but my dear mum passed away on Christmas Eve 2008. 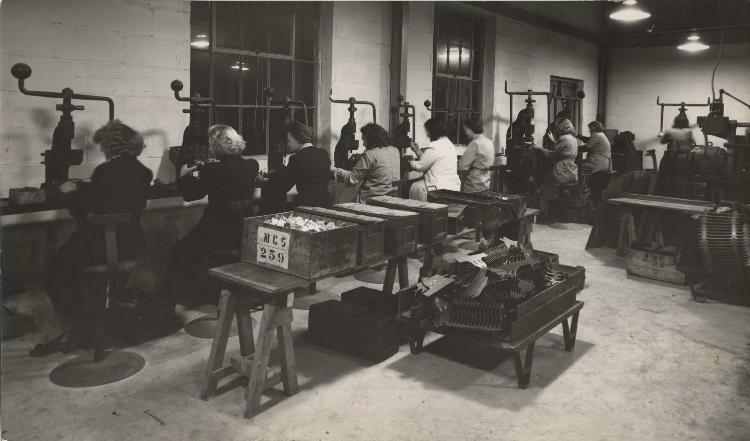 The Women in the photo are operating “Fly Presses”These hand operated presses were used primarily for short production runs. For light material the ball on the top was removed to make it easier to operate.. There were also larger balls for heavy material ,but very tiringfor the operator to run all day . The machine in the foreground is a Shaping Machine, a very basic metal removal machine. They were still in use up to the early 1970s, but you would be hard pushed to find one in any UK machine shop now. 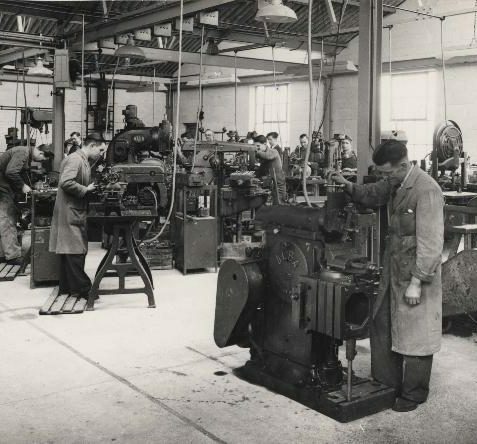 Behind and to the left, three or four very small lathes are being operated. Directly behind and to the right is a Horizontal Mill and to the left a Vertical Mill. It won’t be CVA as the machines are probably far too small for their products. Does anyone know anything about a factory called Dew Barrys? Something to do with scrapping machinery. My mum used to work there in the early 1960s, before that she worked at a perfume factory. Any help would be gratefully appreciated, as I am desperately trying to trace her! Replying to Bridget, sorry not related to your sister’s friend. Hi Debbie. 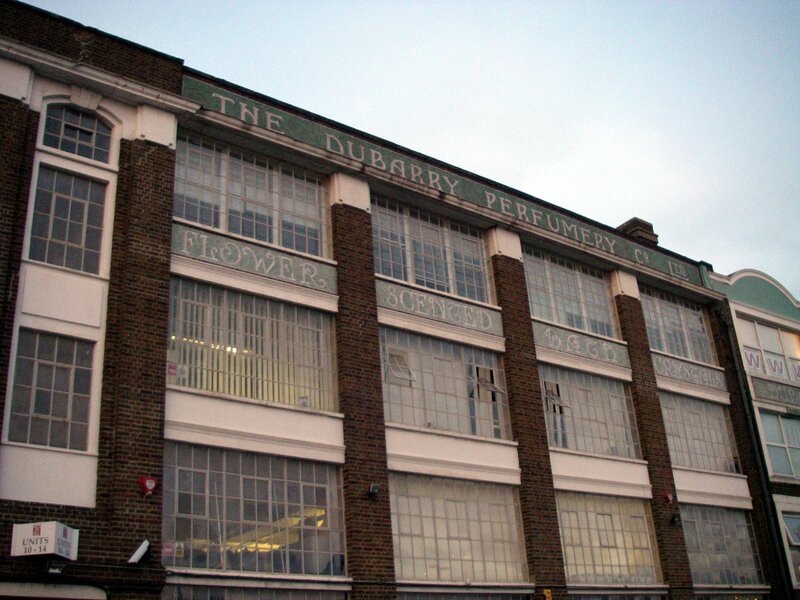 There was a large perfume factory in Hove named Dubarry’s, it closed down many years ago. To Sonia Williams, I am the Grandson of Geoffrey Thompson, and son of Geoffrey Richard Thompson, please email me, would love to hear from you. Richard Thompson. Sonia Williams, I forgot to mention the cinema in question was “The Academy” in West Street, Richard Thompson. I worked at a garage in Beconsfield Road l/h side going out of Brighton, it was next to the Viaduct. This was in the late 50s or early 60s! One day the chap that owned it said – are you interested in seeing something unusual in your tea break? – so I said OK. We then went upstairs and to my utter amazement there before me was a small intact Munitions Factory. All the machinery was still there and the benches etc etc. Time had just stood still. And the guy told me he was in charge of it during the war and they had never bothered to take the machines away. Now I can’t remember what the garage was called – it’s a long time ago and I only worked there about six months. I have a couple of Kellys directories but can’t find the garage name. He sold a few cars and had a service bay. I seem to remember that garage in Beaconsfield Road. I worked just up the road at the same time for a firm called F. Breed & Son next to Forfars the bakers. F. Breed & son were in the business of selling tools to the motor trade as well as power tools. One of my jobs was to deliver tools around Brighton to Endeavour Motor Co. and also to the Isetta works where I was amazed by the assembly line for these little cars. Am I right in saying that the garage mentioned by Dennis was taken over by Bush Signs later on? Mr Grand Dad Leslie Henry Avery was the owner of this shop. I will have a look if I have any other pictures from that era. My brother may have kept some, I will check; he lives in NZ too. We migrated over in the 70s with my Mum and Dad (Pam and Terry). Terry was Leslie’s only son. My neighbour, who has sadly since passed away, had said we had a munitions factory on School Road in Hove, can anyone else confirm this? It would not surprise me that this knowledge isn’t in the public domain, as at the time, during WW II, it would be kept a secret. My neighbour had lived in the street his whole life, so hence, why I feel his knowledge of this area would be reliable. The shaping machine commented on above was still in full working order and in use when I worked there between 1966 and 1970. It was a great company to work for and a good team of people.